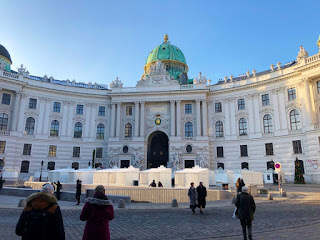 Vienna is the home of the famous Lipizzan hoses and the Spanish Riding School. We were fortunate to be in Vienna at a time when they had scheduled performances. We bought our tickets far in advance in order to get seats. 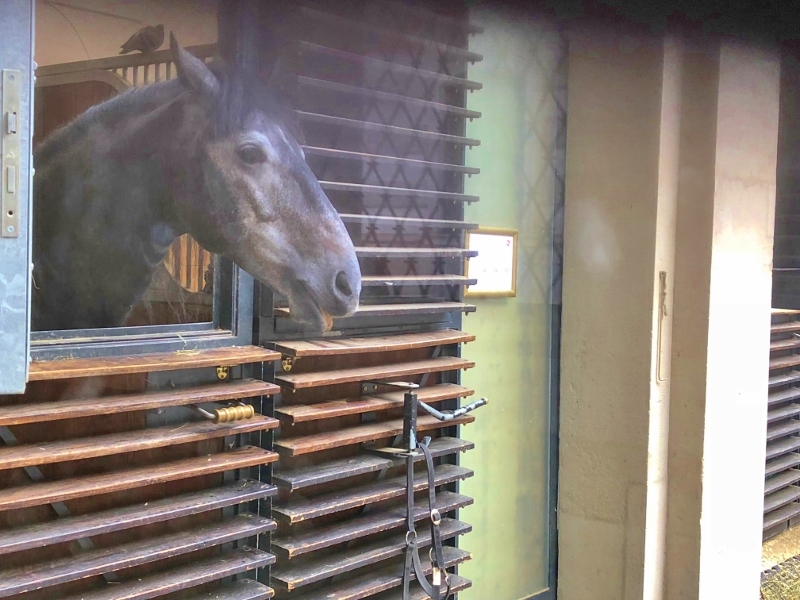 On Saturday morning we headed to the Imperial Palace to stroll around the grounds and take a peek at the stables. 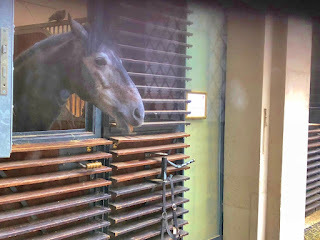 The practice court was being cleaned but the stall doors were half opened and we could see some of the horses inside. One of the younger horses stuck his head out and posed nicely for me. The younger horses are a gray color. They don’t become their famous white color until they have matured. After exploring a bit, we went into the café that was right by the ticket office and grabbed some coffee while we waited for our appointed time to enter the theater. A little background on the horses: The Lipizzans were developed by the Hapsburgs over 400 years ago to be used in times of war and peace. 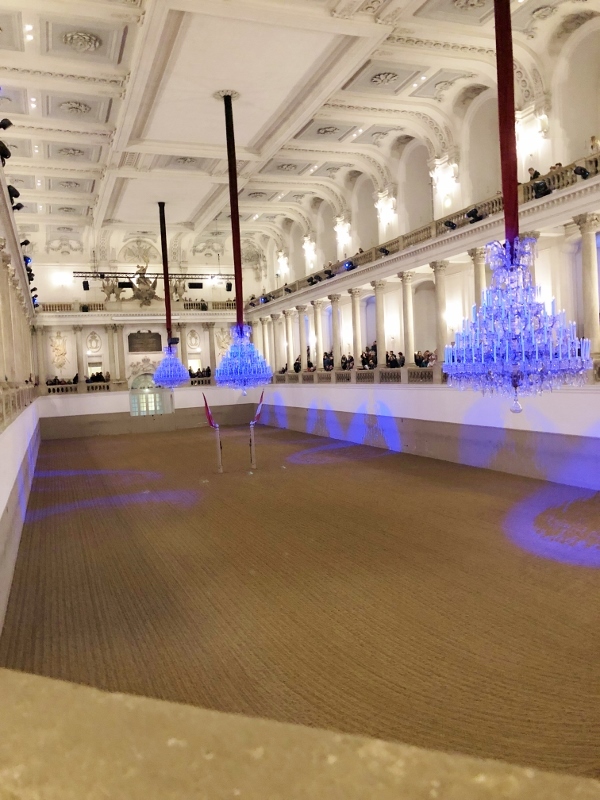 Their unusual abilities apparently helped their riders during battles and carried over into the performance arena providing wonderful entertainment for the royalty. Dressage is a word that until a young lady I know introduced me to was completely unknown to me. The term applies to the fancy stepping a horse is taught to do. The Lipizzans are a special breed when it comes to dressage. I’m sure you have seen pictures or videos of them actually rearing back and jumping into the air. 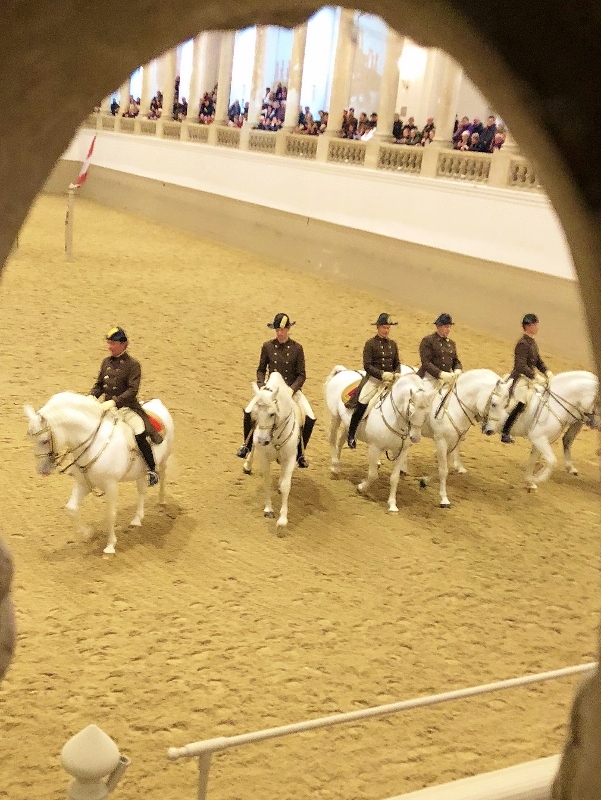 While that is impressive, they also do intricate steps side ways and in sync with the other horses around them led of course by their trainers and riders of the Spanish Riding School. When the time came for us to go in we were ushered into a magnificent and fancy riding ring. Our balcony seats overlooked one end of a large oval area covered in some sort of soil. 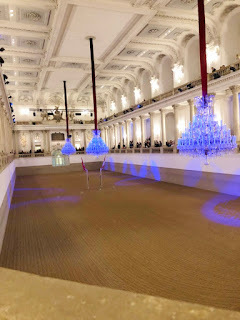 Huge chandeliers hung from the ceiling low over the riding area. They were lit in blue. Once everyone who purchased a seat was in, they let in the standing room only people who filled in large spaces along the sides where there were no seats. We discovered later that the standing room only tickets were 28 Euros as opposed to the 146 Euros we paid to sit (sitting was worth it for me). Finally the chandeliers began to rise and they sparkled with white lights as the announcer gave the opening remarks about what we were to see—in several languages. With much ceremony and even more precision, we watched first the younger horses go through their program. Then as the performance progressed, they were replaced by the more mature horses and finally the highly trained group who did their famous leap. In between we witnessed a ballet of sorts and choreography that reminded me of synchronized swimming. Beautiful horses, smartly dressed riders, all worked together in a performance that left the crowd cheering and exiting in amazement.